Avant le combat, retirez tout bijou susceptible de lancer une aoe. Je vous conseille également de retirer votre arme. Lancez le combat et défendez les ouvriers pendant la construction des tourelles. Une fois que c'est fait, vous pouvez les laisser mourir. Ensuite, attendez que les mobs pop. J'ai fait une petite macro pour compter les gardiens, il faut que leur barre de vie soit visible à l'écran pour que ça fonctionne. Quand vous avez 25 (ou +) gardiens, utilisez les harpons et faites une attaque basique sur le boss (le clic droit suffit) pour le descendre sous les 50%. Attention, sa vie tombe très très vite donc soyez prêt à arrêter l'attaque juste après. Vous n'avez plus qu'à pack tous les mobs devant la tête du boss, et à attendre (faites un afk bio, cherchez un café, ça va mettre 2-3 minutes). Son souffle va tuer les gardiens progressivement et l'évolution est cumulative, donc ils peuvent mourir 1 par 1 sans souci :-). Il ne me semble pas nécessaire de blesser les mobs. Il faut amasser le plus de gardiens sombre rune (que ceux là, les autres ne comptent pas, autant s'en débarrasser au fur et à mesure) à courir après soi et attendre tranquillement que le dragon soit en berzerk. on le fait descendre avec les tourelles, on le blesse à plus de la moitié et quant il souffle (au cas où il ne tuerais pas les mobs du premier coup), il tue les gardiens en une fois. Si ce n'est pas le cas, il suffit d'attendre gentiment qu'il souffle à nouveau sur tout le petit monde qui vous entoure, comme le préconisait Roxxfloor dans son commentaire. Very easy method to do this, use $%^&ty weapons at 90, for example the level 80 weapons you might find in Ulduar. They will reduce the damage you put out on these adds significantly. I did it on my druid in bear form swipe pulling the adds around with Bâton de supercherie so they didn't die from 2-3 hits. I kept all the adds alive and just ate the breath. It took me quite a few attempts to get it, but it wasn't all that hard as people say. You can also use any sort of combat dropping ability to reset her as well such as shadowmeld/feign death/vanish. First of all, this achievement is indeed very odd in the way it works. Not only does Tranchécaille's Souffle de flammes inflict insignificant damage, making it incredibly difficult to kill the dwarves with it, but even if it does, the achievement doesn't always award credit for it. On to the strategy. When you start the encounter, there will be dwarf warriors out on the boss ground. I tend to let the iron dwarves kill them to not have them kill the iron dwarves while I kite them around. While this happens, dispose of the Dark Rune Watchers and the Dark Rune Sentinels. No need to carry around more than you need. Be prepared that when the dwarf warriors are down, they will immediately go for the engineers. It is at this time the Cor de bataille may come in handy. Just make sure to keep them off the engineers. I hit the Dark Rune Guardians once with . This tends to take them down low. If not, I fine tune it with . When more machines emerge from the ground, I root the iron dwarves on me with Enchevêtrement de masse, to make it easier to target and generally deal with the incoming iron dwarves. It also eases off the incoming damage for a little while. When you have a decent amount of Dark Rune Guardians on you, everyone low on health, make sure no more machines are about to emerge and bring Tranchécaille down. Position yourself in front of her, and DPS her if you so desire (just don't make the mistake of using abilities that hit more than one target). When the stun wears off, she will start casting Souffle de flammes. This is the most important part. When the breath goes off, use an AoE attack to kill the dwarves. Timing is paramount. Don't use the AoE too late nor too early. Use it approximately ½ of a second after the breath goes off, i.e. make sure you see the breath clearly before using the AoE attack. When you feel you have enough, bring down Tranchécaille and position yourself in front of her. Ca. ½ a second after Souffle de flammes goes off, use an AoE attack. Make sure you see the breath before you use it. Its really just a matter of add management. Gather the adds up, weed out the Sentinels and Watchers, get the Guardians to around 25-50% then give it a shot. Pop an AoE ability right at the cast of breath for the best chance or just before with Tempête cramoisie since it ticks pretty weak. Expect to only get about 2-4 kills added to your total per breath, even if you have a huge group of them (10+). With my luck the biggest group that she took down at once was 6, I must've had at least 15 on me. Expecting more than that will only leave you frustrated and you'll spend more time managing huge groups of adds for nothing. Many times there were only 2. With persistence you will get to 25. If your engineers die hope that you have a Dague sacrificielle de Ra'sha or Disparition type ability so you can get out of the fight. It is best to use the ability after nothing is attacking any of the expedition fighters so that the fight will actually end. 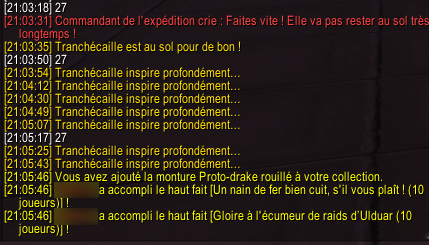 I was trying to achieve Gloire à l'écumeur de raids d’Ulduar (10 joueurs) and I also saw that the counter of Un Nain de fer bien cuit, s'il vous plaît ! (10 joueurs) was not working really well. 3. Use harpoons to bring Tranchécaille to the ground. 4.Gather all the mobs between the face of Tranchécaille and the harpoons. 6. Tranchécaille will begin casting Souffle de flammes. This takes 2.5 seconds to cast so watch the cast-bar. 7. The moment Souffle de flammes's castbar is full - use an AOE spell/ability. Also please remember you don't need to kill the boss to pop this achievement which means you can just reset once Un Nain de fer bien cuit, s'il vous plaît ! (25 joueurs) pops - leaving you free to complete the Quick Shave (25 Player) achievement too. i'm inclined to think that Cor de bataille would come in handy here.. but I didn't have it on me at the time. Just a thought if you're not a tanking class. Once Razorscale is perma-grounded, I cast Graine de Corruption on one of the Dwarves which brought them all down to around 10% health.. then just let breath finish them off.. Even if you strip down to 500 and take off your weapon, it is likely that all of your spells, save one, will one shot the dwarves, including Explosion des Arcanes. I found a nice AOE way to aggro the guardians and slowly bring the dwarves' health slowly to 50% was to use Cône de froid on them. This brought them down nicely to 30 to 40% health in bunches.to where they will die off from the breath in a decent amount of time without you accidentally wiping them out. 1. You have to kill the add while it has the debuff from Souffle de flammes (Flame Breath) in order to get credit and count towards the achievement. As a combat Rogue all I did was kite a huge group of adds in front of her until she cast Flame Breath and then I used Blade Flurry (Which I already had active) and hit the adds. If she kills the add with any attack you will NOT receive credit for it. 2. The add that gives credit for this achievement is a specific add. It is the Gardien sombre-rune (Dark Rune Guardian). They are the medium sized Dwarves that have a 1-H axe. 5. You have to run around a lot and keep the adds out of Flamme dévorante (Devouring Flame). It will kill them pretty quickly. to keep count of the Guardians but with them all scattered about, it couldn't get an accurate count. So with my Monk, I placed my Invocation d’une statue du Buffle noir in the center of the circle and all the adds immediately ran to it. As new adds spawned and remained in the back, I just hit them with Brume vertigineuse and puled them to my statue. Just don't hit them, your statue will pull them off you as soon as you get close to it. With all the adds packed around my statue, I was able to easily keep count using the above script. Once I had about 30 Guardians, I used the harpoons to bring Razorscale down and quickly brought her under 50% health so she wouldn't take to the air again. I targeted myself to keep from attacking anything else and moved towards my statue where all the adds were still neatly packed and did a quick Coup tournoyant de la grue. Quick meaning I canceled it after a second or a little longer. Even with no gear, I killed most of them by letting it run the full duration in an earlier attempt. First of all I attempted to keep the plaftorm clean of the oncoming adds. After Ingénieur de l'expéditions managed to repair all four harpoons I let the oncoming adds kill both Défenseur de l'expéditions and Ingénieur de l'expédition as both of these tend to get aggro a lot. I used Tourment to taunt Gardien sombre-runes. o keep the fight organized and clean I carefully used Lancer de glaive to kill every other mob. However if a Sentinelle sombre-rune spawned it instantly run towards me, so I had to kill him carefuly with a single-target ability. After having at least 25 of the Gardien sombre-rune on me I went to the harpoons and activated all of them. Also I unequipped my weapon. Boss landed, I hit him unarmed until it reached 50% HP and I stopped my damage. After reaching 50% or less the boss will no longer fly up and will start casting Souffle de flammes pretty often. I stood with all of the adds on me in front of boss waiting for it to slowly kill all of the Gardien sombre-rune with its Souffle de flammes. Guardians have around 121k HP, while Souffle de flammes deals just around 18k - 25k damage. It will take a while for the boss to kill the adds. If you didn't kill enough dwarves go away and reset encounter with something like Camouflage dans l'ombre. Dwarf counter won't reset. So you you can just start encounter again and continue to kill dwarves.